Cannot connect "path:1/0/3 host:esxi004..ac.uk deviceLocation:remote-host version:2" to this virtual machine. The device was not found. Cannot connect "path:2/0/1 version:2" to this virtual machine. The device was not found. This was working, it does not work across any hosts. The security keys are Aladdin Knowledge HASP HL 3.25 as available in he devices. Production is down, because NO body at the university can run the applications, because these network keys are unavailable, as a network license! ESXi 5.5 Build 2718055 on 8 ESXi Hosts. Running on Dell R710/R720 hardware. vCenter Server Build 5.5.0 2646482. 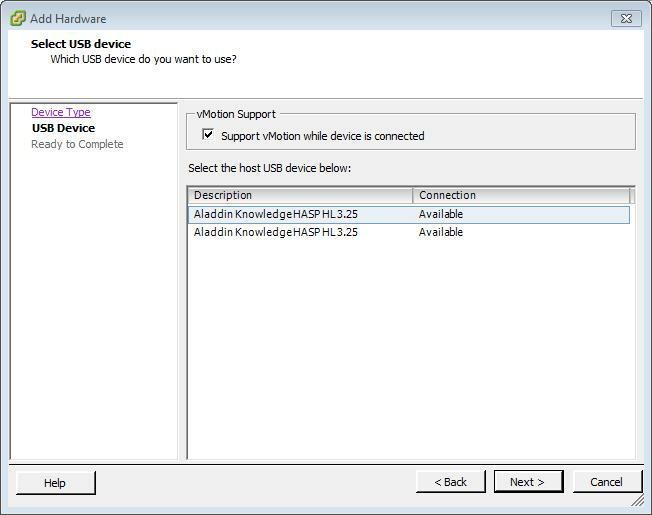 We also have a follow-on question related to USB Passthrough.... the following devices do not appear as USB passthrough devices for the virtual machine but they are recognised by the host? This VMware Support call is flagged as PRODUCTION DOWN! I have reviewed the logs that you have uploaded to the case. At this point there is nothing that points out why you ran into this issue. At this point I have also contacted support to have this KB updated. That is a work in progress and will be carried out. Please note this will be later rather than sooner at this point. For now I suggest that we archive this case. To follow the KB updates I would suggest subscribing to the KB for updates. So if you have no further questions I will proceed to archive the case as resolved later today. So three weeks later, and we still have no idea, so things happen, with no reason why! But the KB Article will be updated, we will see. Interesting to see this; does this issue also occur in View? I have a Sentinel security dongle for Alpha Card software I was trying to connect through a linux-based thin client, and I assumed it was a limitation of the client (I have not yet tested on a PCoIP zero client). where is the USB device connected to client or host ? To the client, using the Horizon View Connection agent for Wyse Linux, specifically on a Wyse D50D. I have not tested the dongle on a Teradici based zero client yet. Okay, USB Passthrough at the Client is handled very differently to Host passthrough, it uses the technology from VMware Workstation, so all if not all USB devices should passthrough. Unless, there is some middle ware which prevents this! I believe it's because of how the Wyse linux-based clients handle devices, namely it needs drivers similar to passing a USB connection through Windows to a console session. This issue also affects biometric readers for Impravada, and because we're currently using the Wyse thin clients in areas the biometric readers would be needed the entire project was scrapped. I'll test the dongle next week on a zero client and report back; based on this discussion I expect a more positive result.